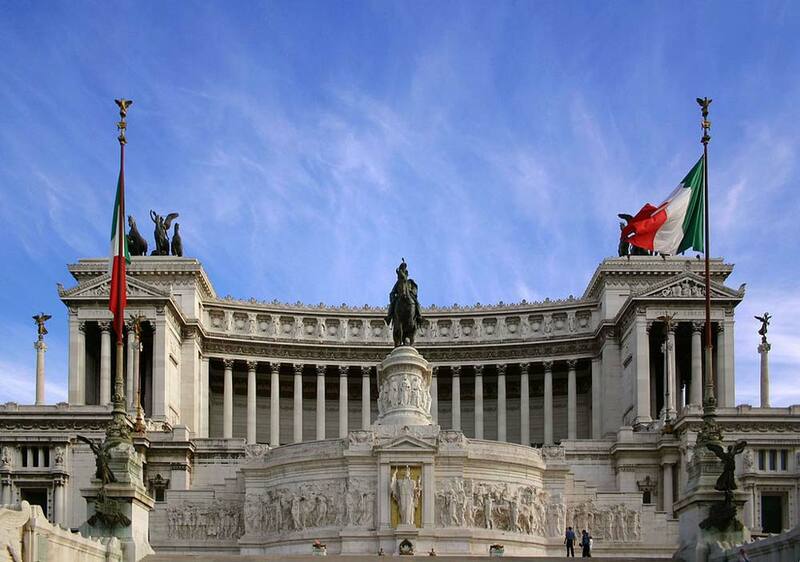 The Altare della Patria is a very large monument in Rome. It was intended as a tribute to King Victor Emmanuel II of Italy, who became the unified country’s first monarch in 1870. The monument’s name translates as Altar of the Fatherland. It is situated in the center of Rome, close to both the Capitoline Hill and the Piazza Venezia. The monument was designed in 1885 by the Italian architect Giuseppe Sacconi. As a deliberate decision to increase the feeling of national pride surrounding the project, a number of prominent Italian sculptors were assigned work on parts of the monument. These included established artists such as Angelo Zanelli and Leonardo Bistolfi. The monument was inaugurated in 1911, although work was not finally completed until 1925. Within the monument is a tomb containing the remains of an unknown soldier, which were transferred to the site in October 1921 from Aquileia. The idea to include such a tomb within the monument is credited to General Giulio Douhet, a pioneer in the theory of strategic air power. The body was selected by a woman, Maria Bergamas, whose own son had been killed in World War One, but whose body had been lost. The remains were granted a state funeral, which was held on November 4th, 1921. The construction of the monument caused considerable controversy in Italy, and in Rome in particular. This was because its huge scale necessitated the removal of a sizable chunk of the Capitoline Hill, together with the district which had stood there since medieval times. A common complaint, which is still voiced, was that the monument was so large that it became overwhelming and vulgar. The main fabric of the monument is white marble, which was quarried in the region of the Brescian town of Botticino. It includes a number of neo-classical details, including fountains and columns in the Corinthian style, as well as multiple flights of steps. Three significant statues are also included. Two are of the goddess Victoria riding in chariots and one of Victor Emmanuel himself mounted on horseback. In total, the entire structure measures to be 440 feet across, and stands 230 feet high, not including the statues. A museum dedicated to exploring the reunification of Italy is housed in the structure’s base. The large number of visitors which the monument attracts led to an elevator being added in 2007. This allowed for panoramic views of Rome from the monument’s roof. The brilliant white marble of which the monument is made makes it stand out from the largely brown structures among which it stands. This also makes it easily visible from much of Rome. The boxy, squat appearance of the Altare della Patria, and its lack of classical features such as towers or domes, had led to it receiving a number of nicknames, some of them derogatory. Residents of Rome often refer to it as The Typewriter, whereas foreign visitors commonly call it The Wedding Cake. Carlo Azeglio Ciampi, who was President of Italy between 1999 and 2006, encouraged the site to be developed into a more publicly accessible area, providing a popular viewpoint across the city.